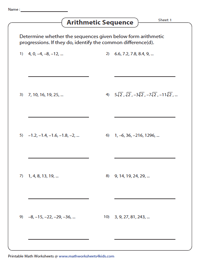 This set of arithmetic sequence worksheets is meticulously designed by math experts that will immensely benefit high school students. Students can get plenty of practice with a number of exercises like finding arithmetic sequence, identifying the first term, common difference and number of terms; finding the next three terms of a sequence, recursive formula and much more! Is it an arithmetic sequence? Observe each sequence of numbers to determine whether they form an arithmetic sequence. Find the common difference - 'd' for the arithmetic sequence so identified. 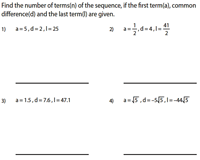 A set of three sequences is provided for each question. 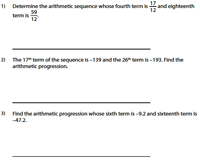 Use the common difference technique to identify the sequence that forms an arithmetic progression. 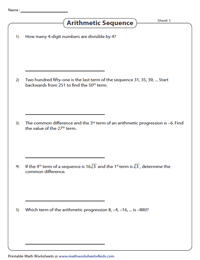 Carefully study each arithmetic sequence provided in this batch of worksheets. Identify the first term of the sequence (a) and calculate the common difference (d). Determine the common difference to generate the next three terms of the sequence and write down your answers. 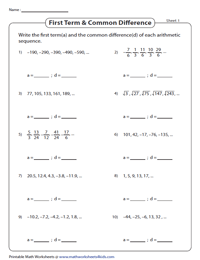 Also, solve the simple word problems included in each worksheet here. 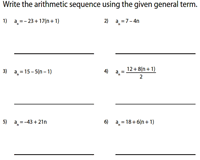 Use the general term to find the arithmetic sequence in Part A. Observe the sequence and use the formula to obtain the general term in part B. 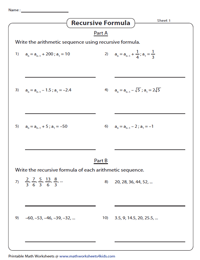 Part A of the worksheets require students to write the arithmetic sequence by using the recursive formula. Find the recursive formula for each arithmetic sequence given in Part B. Substitute the values of first term and the common difference in the nth term formula to find the specific term of the given sequence. 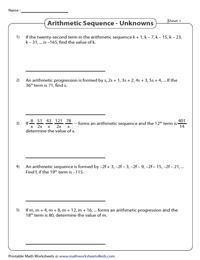 This set of printable worksheets requires learners to find the first term (a), common difference (d), nth term or the value of 'n' from the given arithmetic sequences. Apply the given two terms in the pertinent formula to arrive at the values of 'a' and 'd' to solve this set of two-level worksheets. In Level 1, find the arithmetic progression. Level 2 requires learners to determine the specific term. The arithmetic sequences featured here contain terms that are expressed as algebraic expressions. Use the appropriate formula to find the value of the unknown. To solve Type 1 worksheets, substitute the given values of the first term, common difference and last term in the formula to find the number of terms. For Type 2, observe each finite sequence, identify 'a', 'd' and 'l' and apply the formula to obtain the number of terms.